Astoria visitor information provides the traveler with the necessary information to plan a trip to the Oregon Coast. The Chamber of Commerce is a place you can pick up maps and literature of Astoria and the surrounding area. Links under community web sites can guide you to local history, the latest events and points of interest. Be sure to check the tide tables before going to the beach. 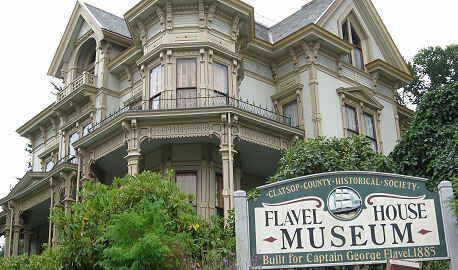 The Captain George Flavel House, built between 1884 and 1886 by Astoria's first millionaire, stands at the corner of 8th Street and Duane and is said to be a masterpiece of Queen Anne architecture. The property, which encompasses a full city block, today is under the stewardship of the Clatsop County Historical Society. Go Northwest! photo by Chelle McNutt-Eden. City of Astoria. 1095 Duane Street, Astoria, OR 97103. Oregon Coast Visitors Association. PO Box 940, Tillamook, OR 97141. Phone: 541-574-2679; Toll-free: 1-888-OCVA-101. The Daily Astorian. 949 Exchange Street, Astoria, OR 97103. Phone: 541-325-3211; Toll-free: 1-800-781-3211. Warrenton-Astoria Regional Airport. 1110 SE Flightline Drive, Warrenton, Oregon 97146. Phone: 503-861-1222. Rose Air. Phone: 503-675-7673; Cell: 503-860-6389. Enterprise Rent-A-Car. 644 W. Marine Drive, Astoria, OR 97103. Phone: 503-325-6500. Hertz Rent-a-Car. 1492 Duane Street, Astoria, OR 97103. Phone: 503-325-7700. Sunset Empire Transportation. 900 Marine Drive, Astoria, OR 97103. Phone: 503-861-5394; Toll-free: 1-866-811-1001; TDD: 1-800-452-0402.